Why is Labour demonising the poor and widening social inequalities? In the paper, Taylor-Gooby claims that it is quite clear that Labour’s policy is more influenced by the imperative of winning votes than by considered plans for the welfare state in the long term. Instead he argues that a more viable and humane welfare state is possible through policies that help those on low incomes and produce a return for society. Examples he cites include providing training for those without skills, or child care so mothers can work, as well as higher minimum wages to raise incomes at the bottom and reduce the costs of welfare. For more information on his response to the welfare crisis, read Taylor-Gooby’s article ‘Making the Case for the Welfare State’ in Policy & Politics or for a press copy contact the Policy & Politics press office on 01179 546721. 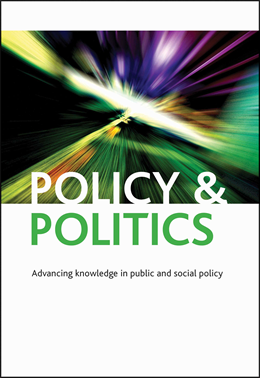 Policy & Politics publishes four issues per annum. ISSN: 0305 5736. Online ISSN 1470-8442. Pingback: Why is Labour demonising the poor and widening social inequalities?